The West Wind Strap Chaise offers the convenience and carefree maintenance of traditional strap furniture in an entirely new package. The 2” wide vinyl straps are woven to create a basket weave effect, and the arms end in a jazzy loop. 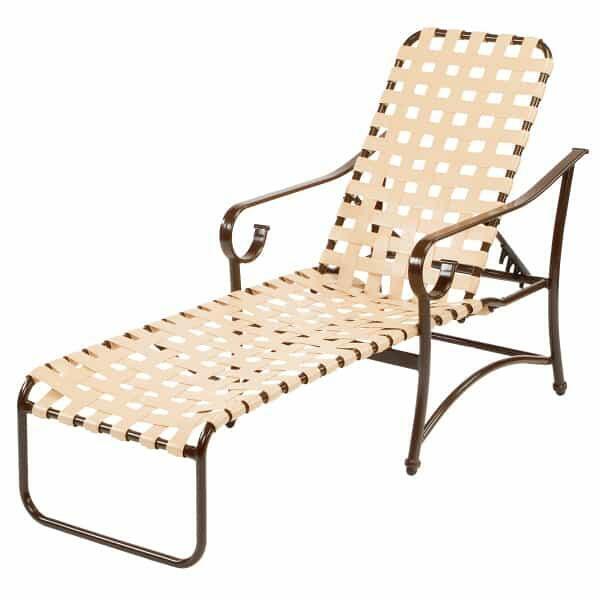 The West Wind Strap Chaise has a weather-proof extruded aluminum frame with a powder-coat finish. The strapping is virgin vinyl and has been treated with UV inhibitors to prevent fading. Proudly made by Windward in the USA, the West Wind Strap Chaise is completely customizable to your taste and needs.